As you enter Das Kino you wouldn’t know that a change has been made behind the stove. The stylish decor of this popular bar remains unchanged despite Oscar and Rosie moving their operation down to Thurland Street. Louis Louis has replaced them however the food remains focussed firmly on pizza. I will say that the previous tenant are a hard act to follow, their metre long pizza’s were excellent and great to share. Nowadays the menu only includes medium and large pizza’s at £8 and £12 respectively. They also do a number of sandwiches (£6.50 and sides). 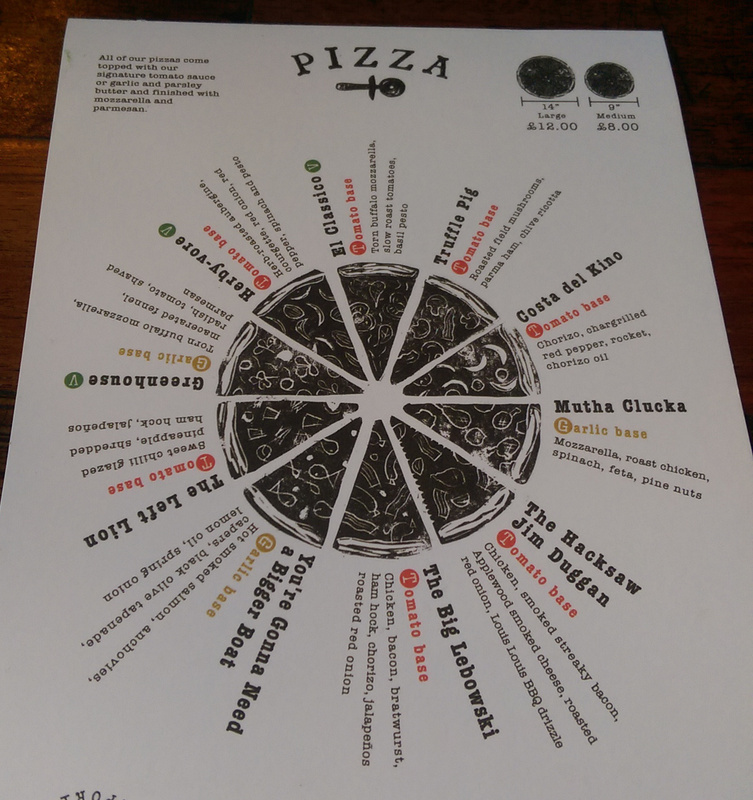 Incidentally a menu in the shape of a pizza is a bad idea, as navigating it requires constant readjustment. Amongst some friends we shared 3 pizzas. 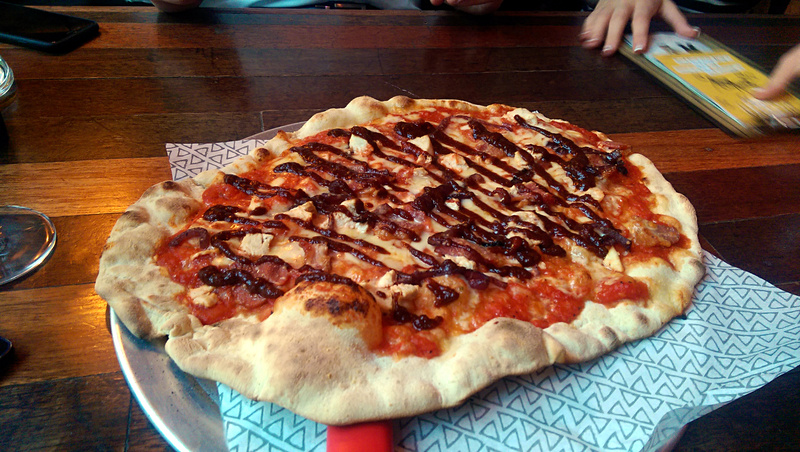 The first was a BBQ chicken number, The Hacksaw Jim Duggan, looked attractive enough with thick lines of BBQ sauce across the pizza. Whilst the base was fine the tomato sauce was thin and bland, it could have been a cheap pasata. 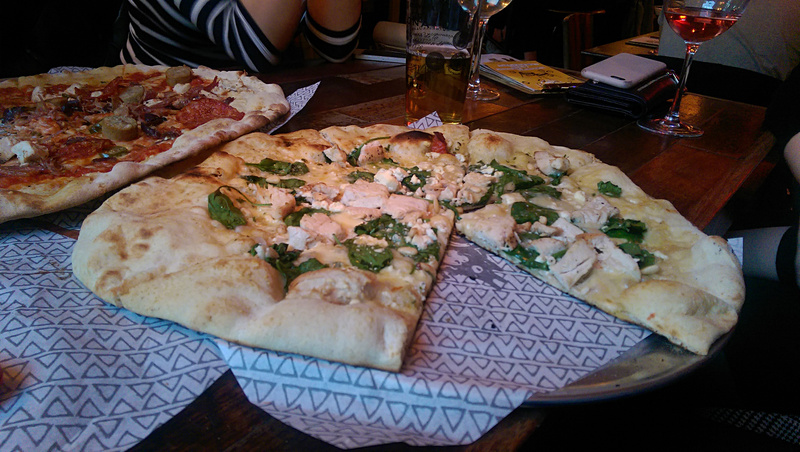 Toppings were generous enough but again lacked flavour and any real seasoning, a theme that ran throughout. The Big Lebowski was similar, decent pepperoni but some uninspiring bratwurst meant it too was a disappointment. We also tried some wedges that plain and again lacking in any excitement. The final pizza was with the second type of base, garlic, and was colourfully named “Mutha Clucka”. It seemed a little plain at first but the chicken, spinach and pine nuts worked well in combination. 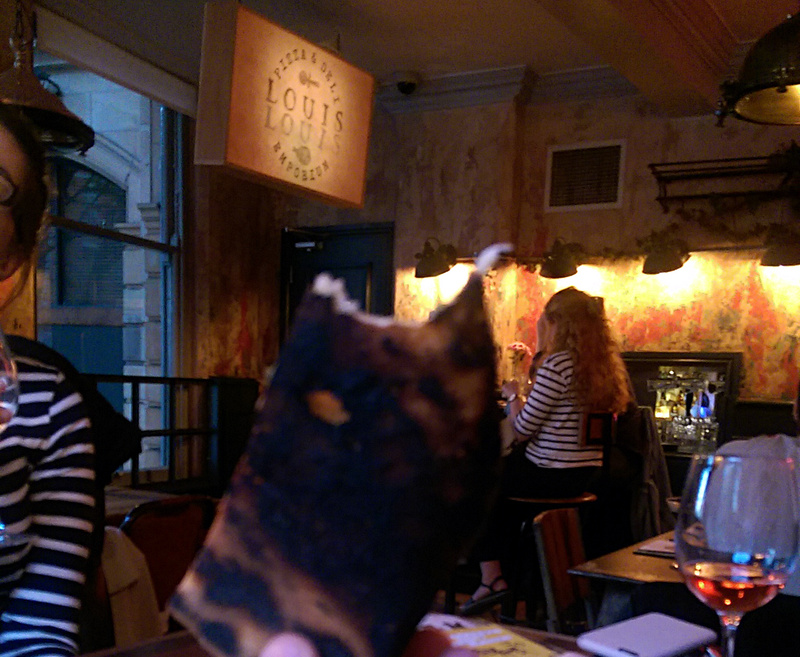 The base though of this one was overdone and in parts a burnt taste dominated. Service was functional; it’s no more than a casual pizza restaurant of course but a lack of napkins for eating slices of pizza is pretty basic stuff. Overall whilst Louis Louis comes in a little cheaper than its predecessor there was a general lack of quality in ingredients and variable execution. A press release I received for Louis Louis described them as “The Friendliest Kitchen in Town”. I’d be happier if they concentrated more on their food than being affable.